We are Emily Oakley and Mike Appel, and we own and operate Three Springs Farm, a diversified, certified-organic vegetable farm in northeastern Oklahoma. We cultivate over fifty different crops on six acres of land. Farming is our full-time job; we don’t have any off-farm income. About half of our crop land is sown in annuals and the other half is in perennials. 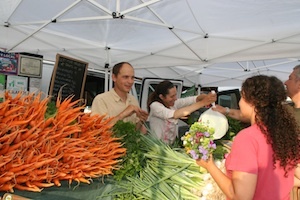 We sell our produce directly to our customers through a farmers’ market and a 100-member CSA an hour away in Tulsa. We sell over a five-month period from April through August. Emily was born and raised in Tulsa, and Mike is originally from Long Island, New York. After convincing Mike that Oklahoma was ripe for young farmers, we moved to Oklahoma in the fall of 2003. Internships on farms in California and degrees in sustainable agriculture made the transition from being interns to full-fledged farmers possible, but starting a new farm is never easy. We were lucky to have the generous support of a wonderful family that let us borrow some land on the edge of Tulsa. All they wanted in exchange were cherry tomatoes! Three seasons leasing made it feasible for us to save money and purchase a farm in the fall of 2006. We have been on our own place for four years. We begin each day with the joy, appreciation, and excitement of getting to do the thing we love best: grow fresh, local food for our community. One of our primary goals is to maintain a two-person operation that demonstrates the economic viability of small-scale farming without interns or hired labor. We aren’t getting rich quick, but we make enough for a simple living and some to save. We enjoy having a true “off-season” that gives us time to recharge our enthusiasm and participate in community volunteer work. We hope to farm for the long-term. Part of being a two-person operation is having the freedom to make decisions that help us avoid burn-out. Oklahoma may seem like an unlikely place to be an organic vegetable farmer, and in many ways it is. There are few, if any, other full-time organic vegetable farmers in the state. But the lack of growers is not reflective of a disinterested clientele. In fact, we have a tremendously loyal and supportive customer base. The farmers’ markets in the state are still expanding and full of opportunities; there is less competition here for young farmers than in other parts of the country where more established farms exist. And it doesn’t hurt that land is so affordable.